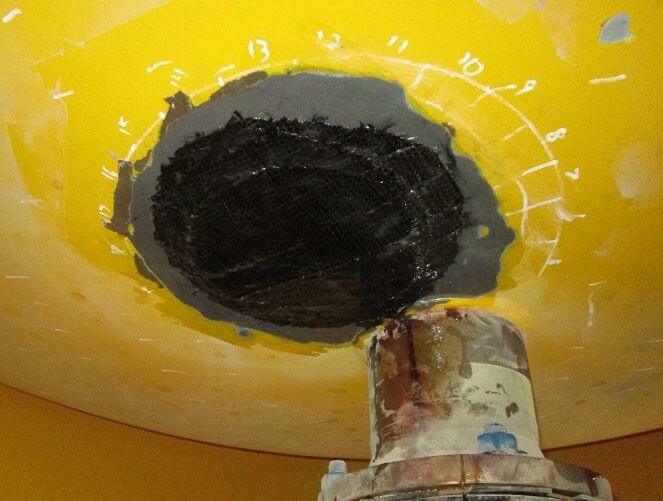 Takeaway: A unique combination of materials and methods allowed an ASME-compliant repair to be executed on a leaking seawater vessel, saving on downtime by not having to drain the vessel. Thomas Belli, B.A. is affiliated with Belzona Inc. and can be contacted using the options on the right. For info on how we work with industry partners click here. In March 2015, an offshore oil & gas platform required a unique solution for the repair of a seawater bulk media filter vessel. 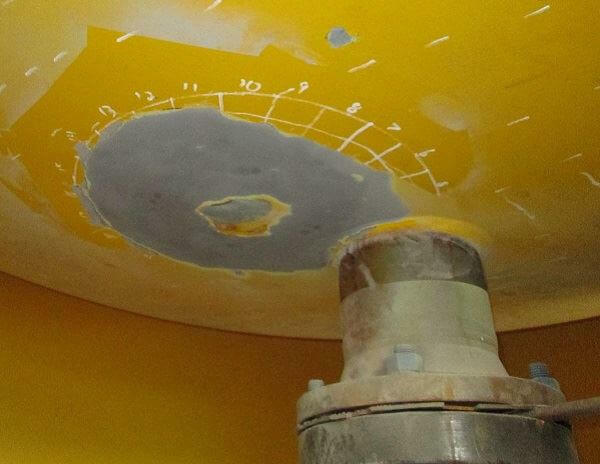 Located in the Gulf of Mexico, USA, the bottom of the vessel was suffering from external damage due to heavily corrosive exterior and interior environments. The damage involved a combination of both thin and through-wall defects, posing a repair dilemma without emptying the entire vessel’s contents. In terms of functionality, seawater bulk media filter vessels simply remove the sediment and grit from the seawater pumped up to the platform. As the seawater enters at the top of the vessel, it passes through the bulk media, leaving the unwanted remains trapped in the beads of the media. Subsequently, this lean liquid is collected and drained for use in both on-board and off-board procedures. Consequently, the asset owner decided to use a bolt to arrest the leak, until a permanent compliant solution was implemented. An epoxy compound was used to plug the leak, and an epoxy composite to repair thin and through-wall defects. Following investigation of alternatives, evidence suggested that competitor products were unable to provide a sufficient composite patch; therefore the customer selected a new generation-compliant composite repair system in order to complete the repair. After careful selection supported by an engineered design, the repair application was carried out in compliance with American Society of Mechanical Engineers (ASME) standards. At the outset, the bolt plugging the hole was removed and the filtered water was drained, allowing complete access to the corroded area. The through-wall defect was plugged first using a malleable epoxy compound that was shaped to fit the prescribed affected area. Highly adhesive and water-resistant, the compound provided an excellent temporary solution to stop the process vessel’s leak. The original vessel coating was then removed by hand sanding before the carbon steel substrate’s thin and through-wall failings were rebuilt using an epoxy composite. Designed to adhere to wet, oil-contaminated and underwater substrates, this surface-tolerant material was the most suitable repair solution for the aqueous environment. Cleaned, blasted surface following initial repair. In reference to the design, three wraps (six layers) of the composite repair system were applied to the repair area to reinforce the bottom of the filter vessel. This composite wrap was chosen because of its application versatility and proven efficiency in repairing weakened and holed tank walls. 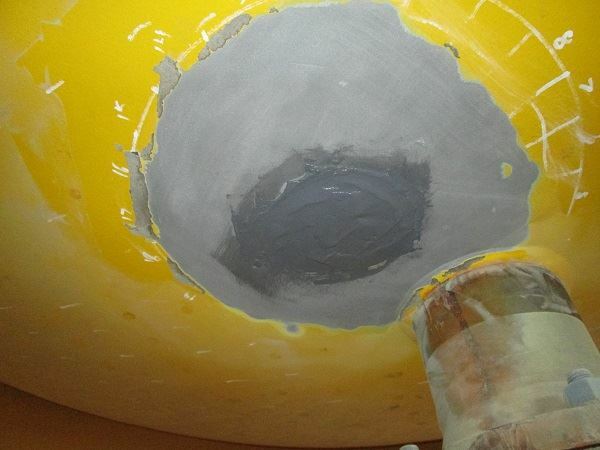 Using epoxy resin to create a mold of the vessel’s surface, the repair was consolidated by applying pressure against the template, creating a secure and tight seal around the defect. The composite repair system applied per engineered design. The customer chose the composite repair system because of the long design life and overall ease of the repair process versus traditional welding methods, which can incur a number of health and safety issues. By using a composite patch, they were able to avoid emptying the entire vessel, including filter media, hence saving a considerable amount of downtime and labor. Written by Thomas Belli, B.A. Tom Belli received a Bachelor of Arts degree in Advertising and Marketing from the University of Lincoln. After graduating, Tom began working for Belzona Polymerics Ltd. as a member of the marketing department in the company’s Harrogate corporate office. Tom focuses on writing a combination of case studies and technical articles on corrosion mitigation topics, alongside developing marketing materials for the company’s various online platforms.